Don't have time to "un-do" the day before you hit the hay? We have three nighttime tricks to help you wake up all glowy and smooth because even without total TLC, complexion perfection is possible. Begin with Clarisonic Plus with Fresh kit ($225 at Sephora.com) that includes the best-selling Clarisonic Plus for Face and Body with skincare products from Fresh Cosmetics. 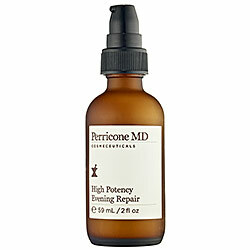 PERRICONE MD's High Potency Evening Repair resurfaces skin to improve texture, minimize pore size, even skintone, and reveal a luminous look. Philosophy's When Hope Is Not Enough Replenishing Cream ($48 at sephora.com) is a dermatologist recommended intensively emollient moisturizer designed to quench, protect, and restore even the driest of skin.